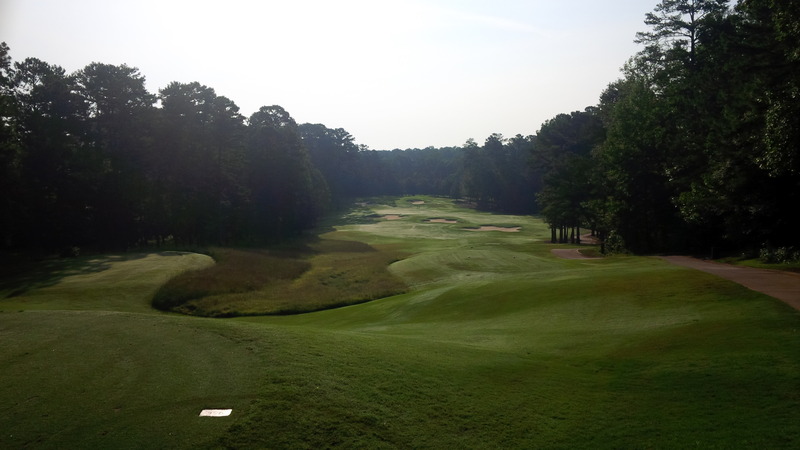 We played the Lake Course at Grand National a mere 9 days after it hosted the PGA’s Barbasol Championship. 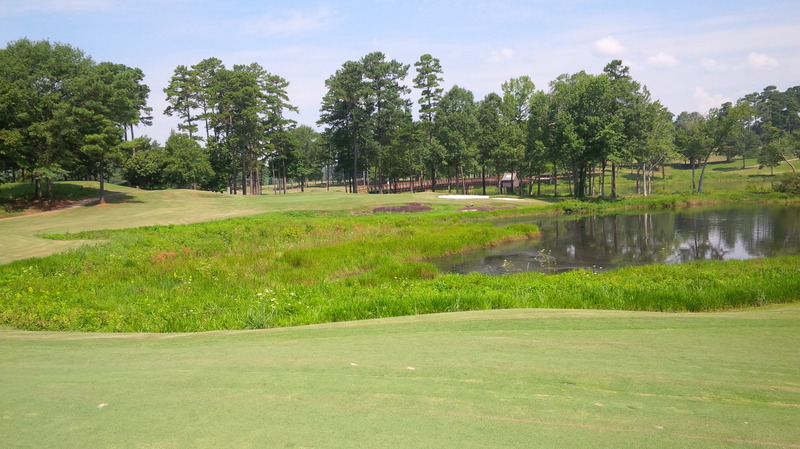 Playing Grand National’s Lake Course on the Alabama Robert Trent Jones Trail one week after the PGA Tour’s Barbasol Championship was contested on the course was a rare treat for our group. It is probably as close as we hacks will get to competing on a venue set up to host some of the highest level players in the world. Created by Robert Trent Jones, Sr., and Roger Rulewich in 1992, the Lake Course at Grand National was built on what Jones considered perhaps the single greatest site for a golf complex he had ever encountered. The incredible scenery accompanying the course and the astounding diversity of the golf holes supports such a hyperbolic assertion. 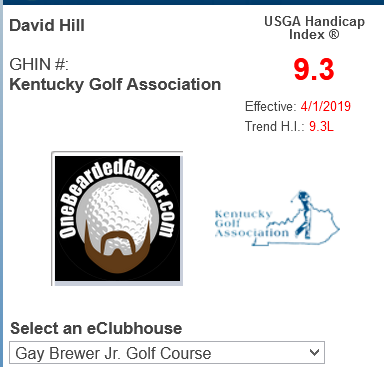 We were (accurately) warned that driver was a bad play from the first tee, which was only the first of many difficult club selections on the day. The Tour’s influence on this beautiful and challenging course was obvious, before we’d even hit a shot. The Grand National complex grounds were in tip-top shape, befitting the immaculate conditioning of the Lake Course’s playing surfaces. 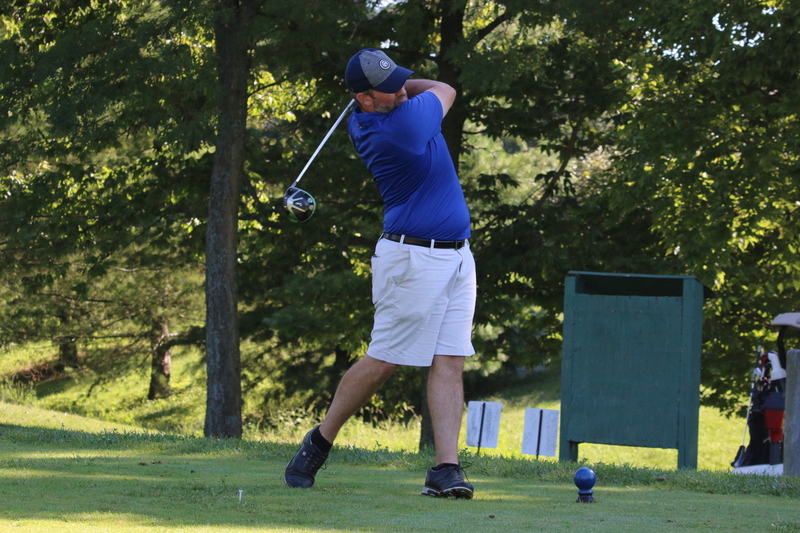 On the first tee, the starter warned us that the fairways, approaches, and greens were still being mowed close to the Championship’s level, as the superintendent was slowly walking the course back to “normal” conditions. This meant every surface was still being mowed even shorter than normal, which, in turn meant the Lake Course played extremely firm and fast. 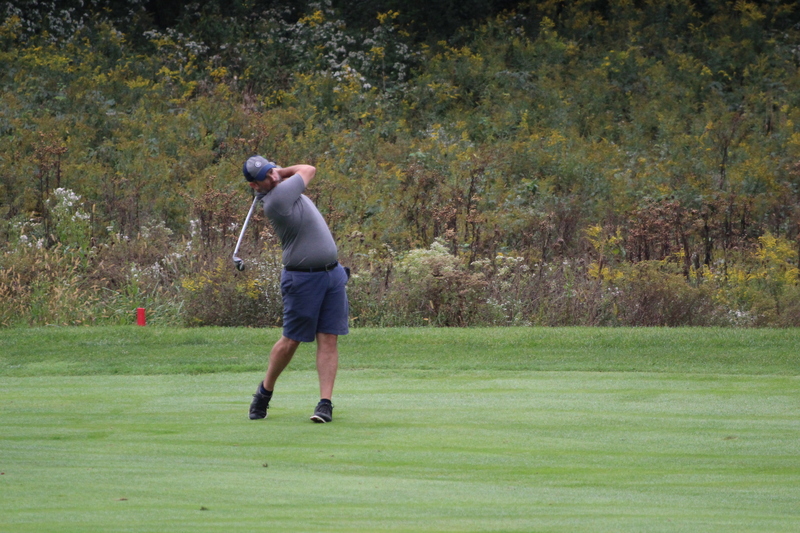 When we disclosed that we’d played the Judge and Senator courses at Capitol Hill the prior day, the starter agreed that was probably the best preparation we could have had for the challenges that the Lake Course’s greens would present. He was absolutely correct. Whether playing great or poorly, it’s difficult not to find a little serenity in the magnificent views on the Lake Course. Despite our whirlwind adventures and the 7:00 a.m. tee time leaving us a little weary, Matt, Bryan, and I retained enough sense to stick to the plan to the play the orange tees rather than try to play from where the professionals had played less than ten days prior. The orange tees, which played to nearly 6,500 yards, proved to be plenty enough challenge with a slope and course rating of 71.3 / 126. 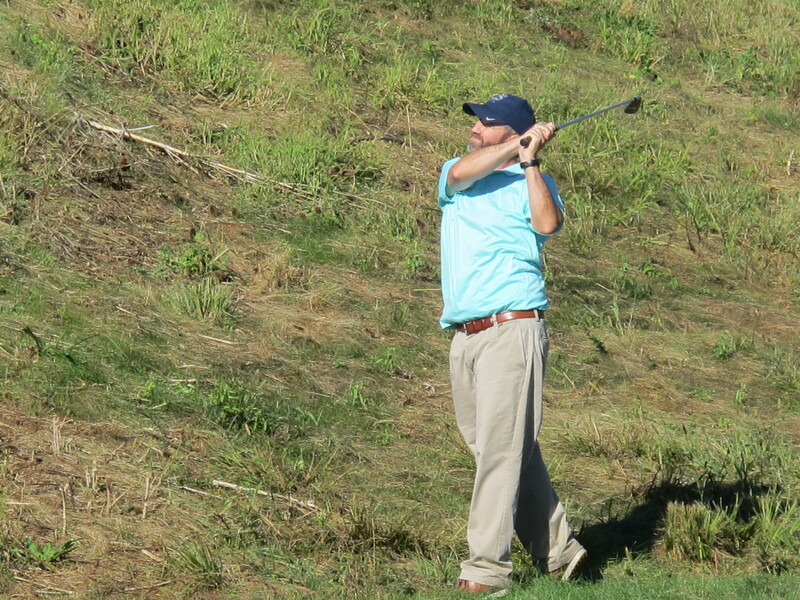 The tips, in contrast, played to 7,149 yards with a slope and course rating of at least 74.3 / 136. However, the numbers don’t do justice to the enormous difference in the difficulty and skill required of the tee shots from the championship tees compared to from where we played the course. 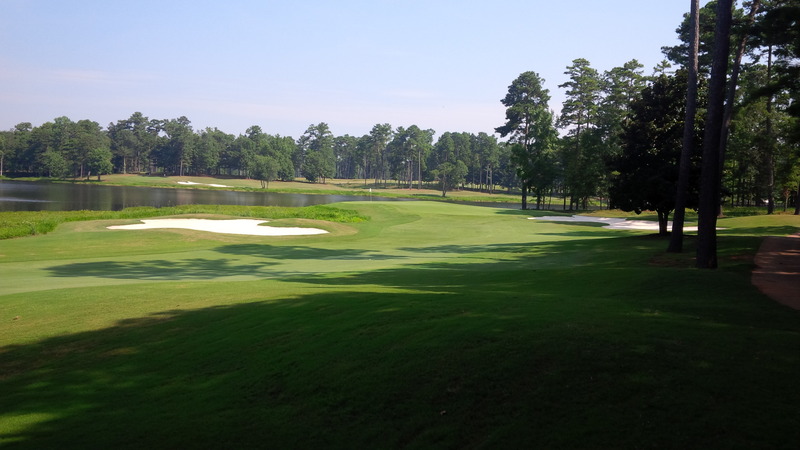 A staple of RTJ Trail courses, and Jones’ designs generally, the use of bunkers on the Lake Course are the perfect complement to the mounding and abundant water hazards. Without physically laying eyes upon where the professionals played the Lake Course, it is hard to appreciate the immense challenges created by the additional distance, different angles of attack, and discordant elevation changes compared to the “back tees” that were mere mortals play golf from. Despite not being utilized by the tour pros, the orange tees were perfect: level, full of lush grass without a single blade of crabgrass or nutsedge. 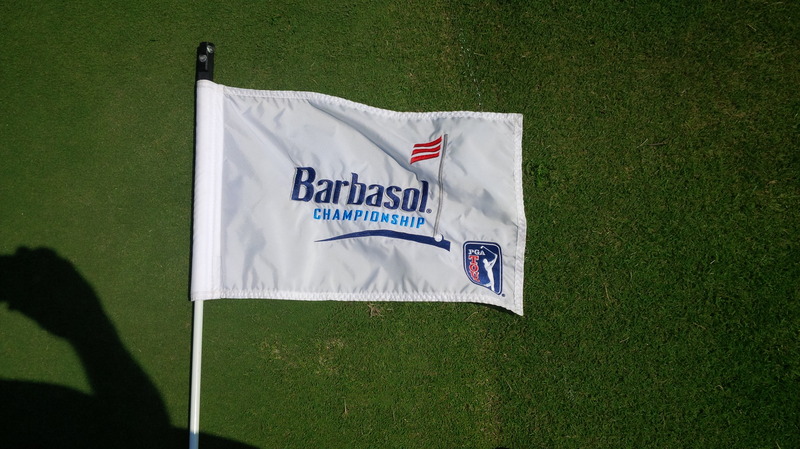 The Lake Course’s fairways were in great shape considering how closely they had been shaved for the Barbasol Championship, with the course suffering under the unrelenting heat and humidity of July on the southern Alabama plains. The short par 4 5th hole uses bunkers and long rough without any water hazards to frame one of the most memorable and difficult of the Lake Course’s holes. 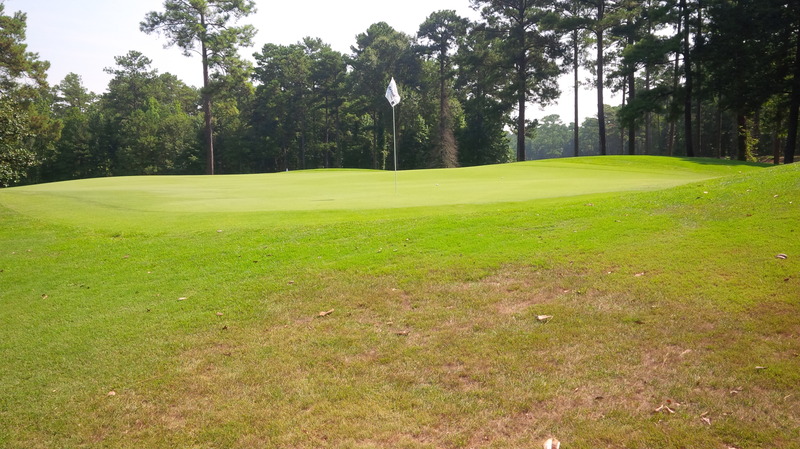 Many of the closely mown areas around greens were still recovering from being slightly scuffed (it’s hard to fit a 24-48 inch cutting deck on a lot of those hillsides, as most greens slightly elevated), but any damage was only cosmetic and didn’t affect playability. The Champion Ultradwarf Bermuda grass covered greens, mowed somewhere between PGA Tour level height and “normal” height during our round, were still lightening quick. Moreover, the greens remained rock hard in near tournament condition. The greens would hold a well struck shot that landed on or near the putting surface, but summarily discarded thin mis-hits. The design of the greens also emphasized of approach shots arriving from the improper angles of attack. 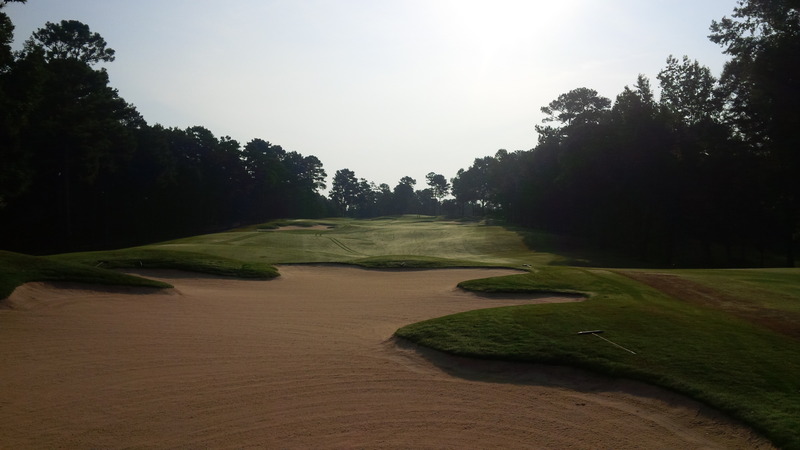 Even from the fairway, being anywhere but the “A” position usually required negotiating one or more green-side bunkers, protective mounding, or a short-sided lack of green to work with. This sucker pin on the 12th green illustrates how the Lake Course uses multiple layers of trouble to create a visually intimidating golf course. 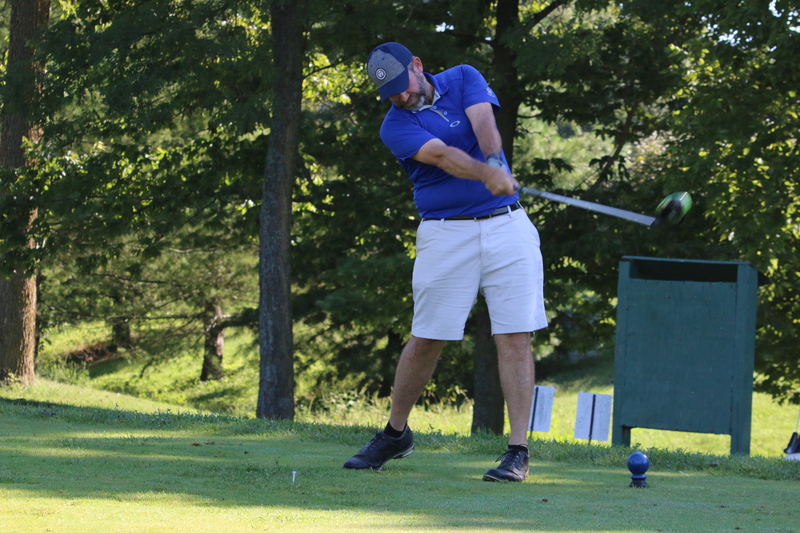 Our Tuesday morning hole locations were not Sunday pin placements, but definitely on the unyielding end of the difficulty spectrum, though the degree of difficulty was somewhat alleviated by how smoothly and true putts rolled on the flawless surfaces. 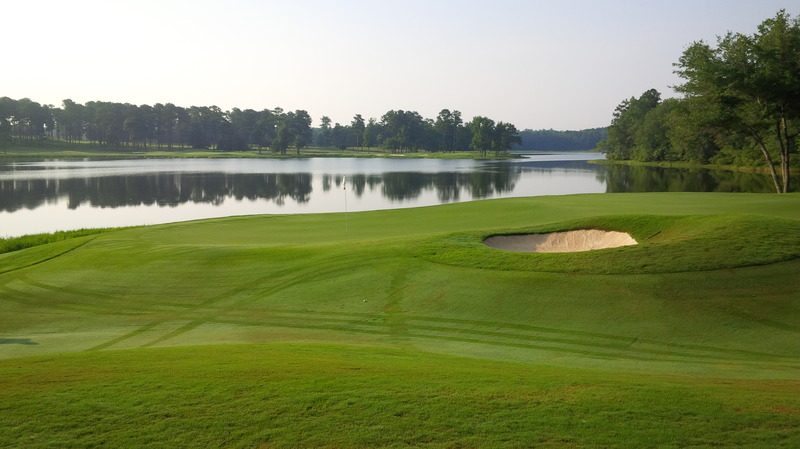 The Lake Course is not particularly narrow off the tee, but the preferred landing zones are littered with bunkers, moguls, drop-offs from elevated fairways, and most prominently, water hazards. 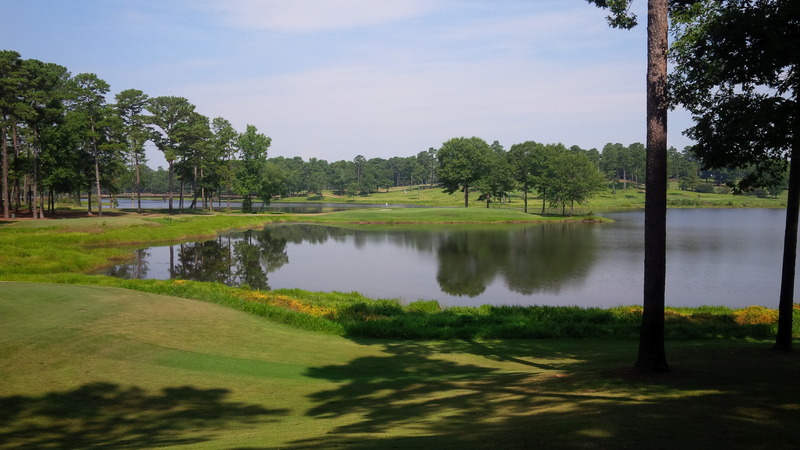 The water of Lake Saugahatchee is in play on ten of the eighteen holes. The course is not what I’d consider a bombers paradise, but it certainly isn’t target golf either. On each hole, there were fairly obvious good areas and less desirable areas, but there was usually more than one way to successfully attack each hole. Preparing the course for the PGA Tour left a few cosmetic blemishes on the course, but nothing that I wouldn’t expect to heal in a few short weeks. On many of par 4 holes, what club and shot to play from the tee was a crucial, and not always obvious, decision. Hitting driver was at best a big risk/reward decision on a lot of holes, usually with a severe penalty (commonly water) for choosing or executing poorly. One of the best qualities of the Lake Course is that there aren’t any repeated shots. I had to execute draws and attempt fades (commonly poorly), and used every club in my bag during the round. An unexpected quality was the tremendous routing of the course; specifically, there is a tremendous amount of elevation change from tee to green for a course that has more than half of its holes framed by the same body of water. From 230 yards, this is the view the professionals encountered at the signature par 3 15th hole. Mercifully, our tee box was significantly closer to the island and from a less troublesome angle. 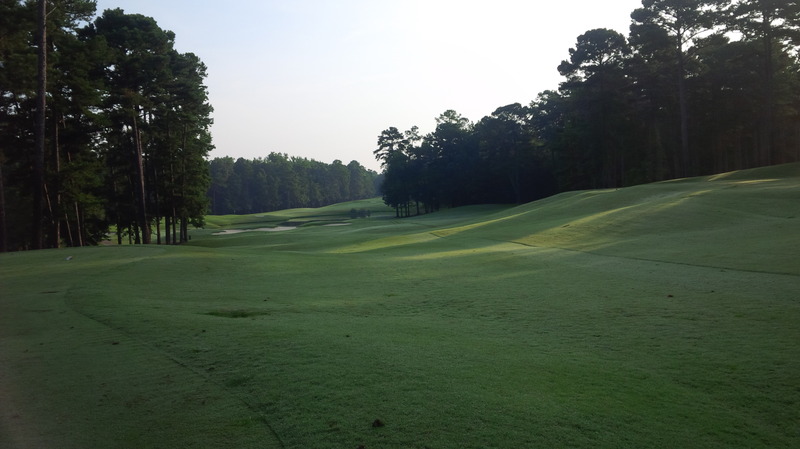 As advertised by the RTJ Trail website, the Lake Course’s collection of par 3 holes may be as strong a group as I remember since playing Harbour Town and Idle Hour last year. The course’s most profound “Wow” moment occurs standing on the island green of the 15th hole, surrounded by the lake on all sides with the enormous cart bridge in the background providing the signature Lake Course experience. (Author’s note: my fondness for the par 3 holes may stem from the tremendous number of skins I captured due to clutch putting on these holes in particular). I’m not necessarily a fan of par 3’s as closing holes. However, the Lake Course’s 15th hole is such a magnificent hole that it could bear the weight of being the lasting memory for all 18 holes. If I can have a criticism of the Lake Course, it would only be that with some severe elevation changes and an over (from the clubhouse to 10th tee) and back (from the 16th green to the 17th tee) across the bridge spanning the lake, walking the course would be difficult at best and legitimately dangerous during the summer months. Otherwise, from design to conditioning to how much fun it is to play, the Lake Course at Grand National is fantastic. It is a difficult golf course, but not so hard that it saps the fun from the game. Instead of dreading the next difficult shot, I found myself looking forward to the next unique challenge with each successive hole. Possibly driveable by pure distance, there are as many potential impairments as there are ways to attack the short par 4 16th hole, which is, in essence, what makes the Lake Course so much fun to play. Getting to play the course so close in time to its hosting of a PGA Tour event made the memory all that more indelible, and something I would highly recommend be done at least once. The Lake Course is a no-brainer must play experience for the golf enthusiast and the perfect destination for a golf getaway. 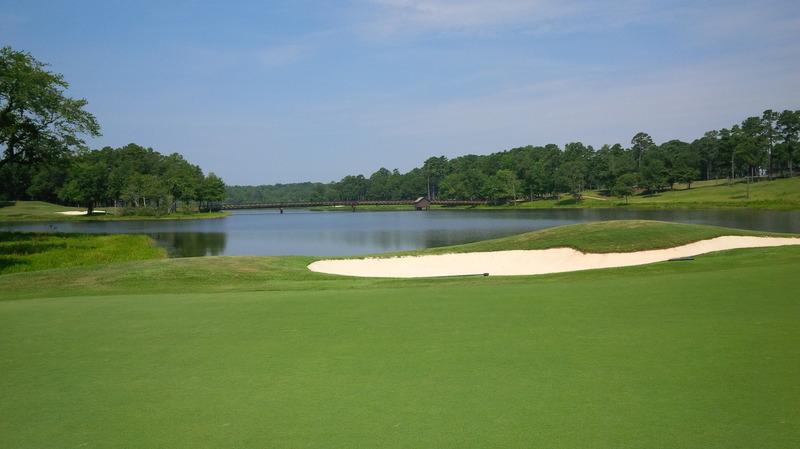 Dave, great review of Lake and what a treat being able to play in PGA Tour condition! 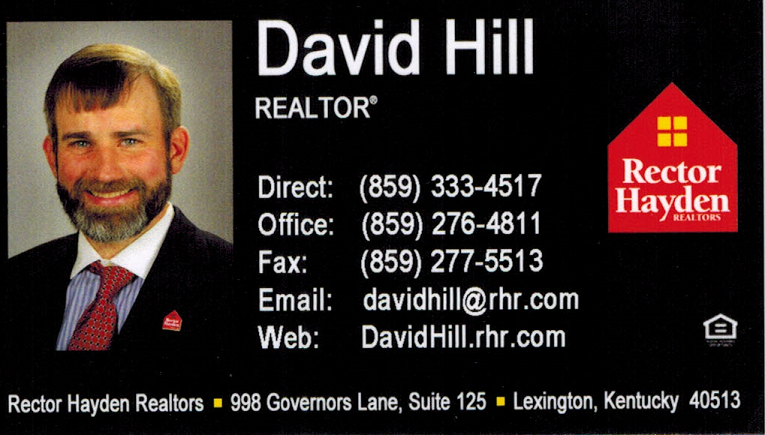 I’m very envious. Your comments brought back memories of my trip to Grand National in 2013 and our recollections of how to play the course are similar. I too hit very few drivers and played from the Orange tees. Funny how your experience on the par-3s brings back positive thoughts because of your stellar play. I splashed two on the 15th and carded a quad 7 which punctuated a back nine collapse, but loved the course despite. Hope your grooves were clean and your Pro Vs were biting!